About this object The second Speaker of the House, Jonathan Trumbull served three terms in the House before being elected to the Senate. On this date, President George Washington signed into law a bill that established the U.S. War Department. The measure had moved through the First Federal Congress (1789–1791) with relatively little controversy. 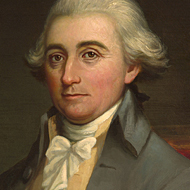 With Jonathan Trumbull, Jr., of Connecticut presiding over the Committee of the Whole, the House debated the authorization bill in late June 1789. Pro-Administration Representative Egbert Benson of New York introduced an amendment to include a phrase to the effect that the War Department Secretary would be “removable by the President,” echoing language that had been included in a much more rancorous debate a few days earlier about the duties and powers of the proposed Secretary of Foreign Affairs (later the Secretary of State). Roger Sherman of Connecticut and John Page of Virginia opposed Benson’s amendment, but it carried narrowly, 24 to 22. The entire bill passed the House easily on June 27, with little debate in an unrecorded vote. Soon thereafter, the Senate passed the bill. In choosing the department’s first secretary, President Washington preferred continuity. He nominated Henry Knox—a key aide during the American Revolution and, since 1785, the secretary of war under the Articles of Confederation.